Zen priests are linked with two very characteristic elements of Japanese culture: the exquisite simplicity of Japanese ceramics; and the formalities of the Tea Ceremony for which much of the pottery is designed. 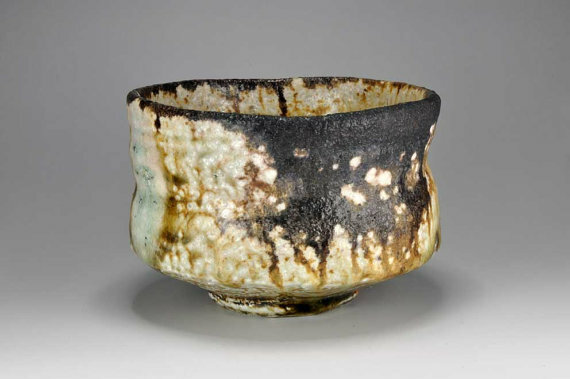 The story of Japanese ceramic pottery dates back the early period of 1223 when a Zen monk takes a Japanese potter, Kato Shirozaemon, to China to study the manufacture of ceramics. 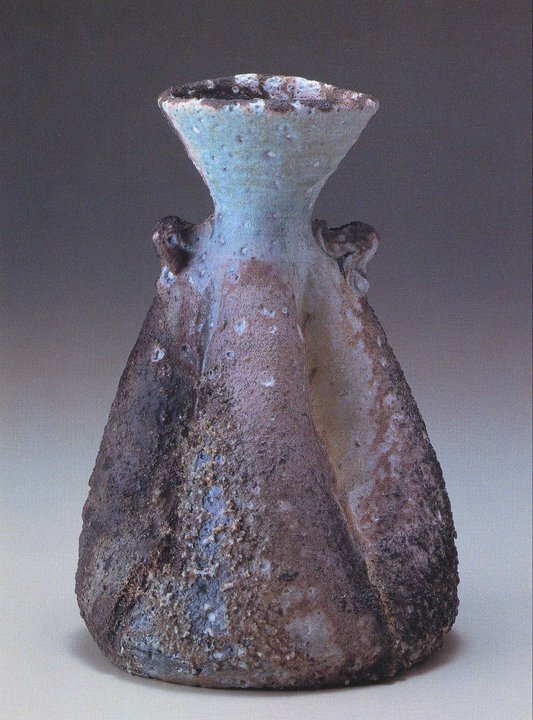 This is a period, in the Song dynasty, when the Chinese potters achieved a perfection and simplicity. 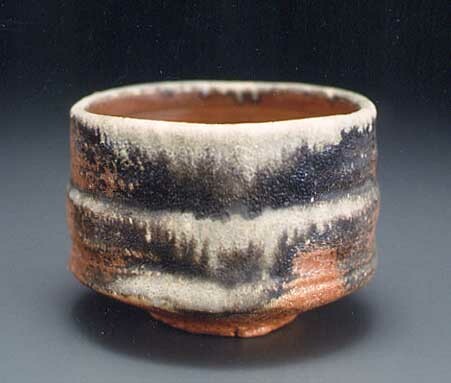 Similarly during this period the birth of Japanese pottery naturally evolved its own styles to rival this perfection. 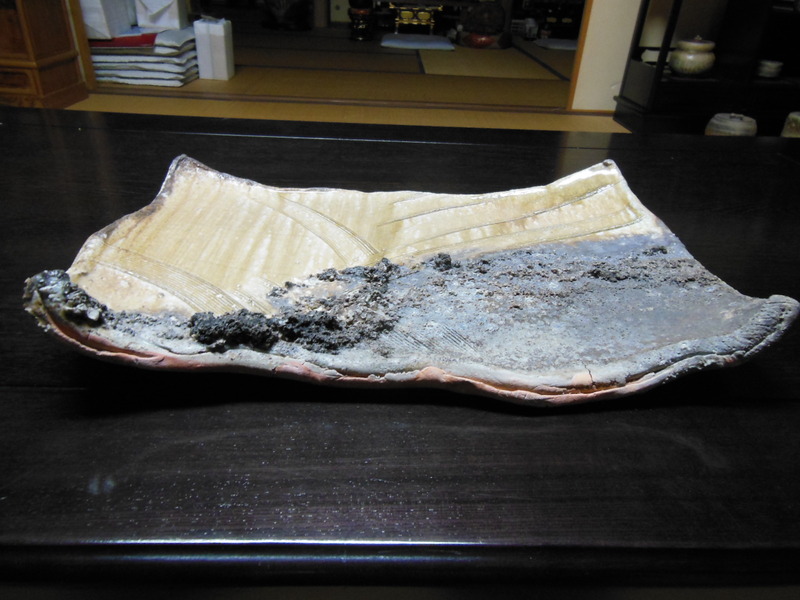 It is meaningless just to inherit the traditions of Japanese pottery, unless you add your own ideas…but if you overdo yourself, you might ruin the traditions. The point is to make the best use of the old methods and ideas. Every pot you make must be your own original creation. It should not be a mere arrangement of old techniques. You see, we are living in this world of today, so therefore we must use the fire of today and sing the songs of today. It sounds easy, but it’s a very hard thing to do. The above quotes describes the nature of traditional Japanese potters, is how we relate to our next guest master craftsman ceramic potter Shiho Kanzaki. Welcome!! Thank you for joining us in our VIP Creative Lounge for an exclusive interview. 1. Sunil – What inspired you first to become a ceramic artists? Shiho – Sunil san!.., When I saw an exhibition of the art of ancient India at a museum in Kyoto during my student days, I was very deeply touched to my heart. I was terribly shocked by the ancient Indian stone statue sculptures. This is because in general, religious art is far removed from the common world. What I saw at this exhibition was the harmony between religion and secular things, the sensual world in which aspects of essential human nature were expressed by individual statues. Eastern spirituality was communicated through these statues. This excitement led me into the world of clay sculpture for a while, during my senior year in college. Though I was absorbed in reading legal books, whenever I got tired of reading, I took the clay in my hands. When you clasp the clay tightly, the clay will copy the complex shape of your fingers. The reason why the clay relaxes my mind is that the movement of my mind is communicated through my hands, and gives life to the clump of clay. There is no other way to express my own feelings as honestly and faithfully, is there? 2. Sunil – Would you like to share your story of how you began your dream of becoming a Japanese ceramic potter? The Shigaraki potters came to see my anagama firing one after another when they found out that I was having a firing. They were telling me these words before they went home. 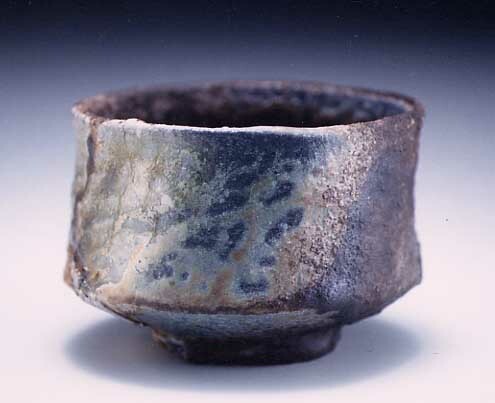 In those days (1974) there were only three potters, including myself, who had built an anagama kiln in Shigaraki. There were many more potters who were interested in the anagama kiln. It was obvious to everyone that I was using unseasoned firewood. Their words echo as if they struck my heart. Since the kiln’s temperature was not rising smoothly, my apprentice and I were frantically trying to find a solution. We felt more and more gloomy. That night, we couldn’t sleep at all. We had worked without rest and I had tried everything in my head. My apprentices said nothing and they looked utterly exhausted. It was the seventh sunrise since we started firing. And our minds were wandering in total darkness. I and my apprentices I had made frantic efforts during the night. Thirty hours of searching for a glimpse of a possibility, trying everything I know, and exhausting all my strength and still the temperature wouldn’t rise. Can I hold on any longer? Our fatigues has reached the limit, mentally and physically. “Hey! Take the pyrometer off immediately.” I said harshly, almost in despair. After saying that, I’ve held my head between my hands. My apprentices also was exhausted. In spite of that, as I was in a bad mood, they were more cautious than usual not to upset my feelings at all. At last I found a way of firing, by placing the unseasoned wood in a pattern of a the cross. Upon the center of that kiln, I stoked 3 or 5 very thinly split pieces of firewood in the shape of uprights “||||”, and on the top of those firewood I stoked some pieces in the shape of horizontal “=”. Repeating this procedure many times, I stacked the crossing firewood in the kiln. The temperature was getting upper and upper. The kiln reached a high heat. At the opening day, I removed the clay slip from the fire mouth, and opened the door gently. Inside the kiln was pitch dark, so I couldn’t see anything. Within reach from the fire door, there was the Iga. I put my hands into the kiln. It was still very warm inside. My hands touched the work. Through double layered cotton work gloves I felt the heat of the work. With crackling sound it was removed from the base. I took it out from the kiln very carefully In order not to damage the work. The work made a high-pitched sound. That is the characteristic sound when unloading the kiln, which you hear when the work cools down. That thin pitch elevated the tension. They tried to touch the work, stretching their hands, but I didn’t let anyone touch it. I stroked and stroked it as I sat down embracing the work. This is IT, I have been pursuing this works. Can you also share with us your experience of your next turning point of your first solo exhibition that you could remember? 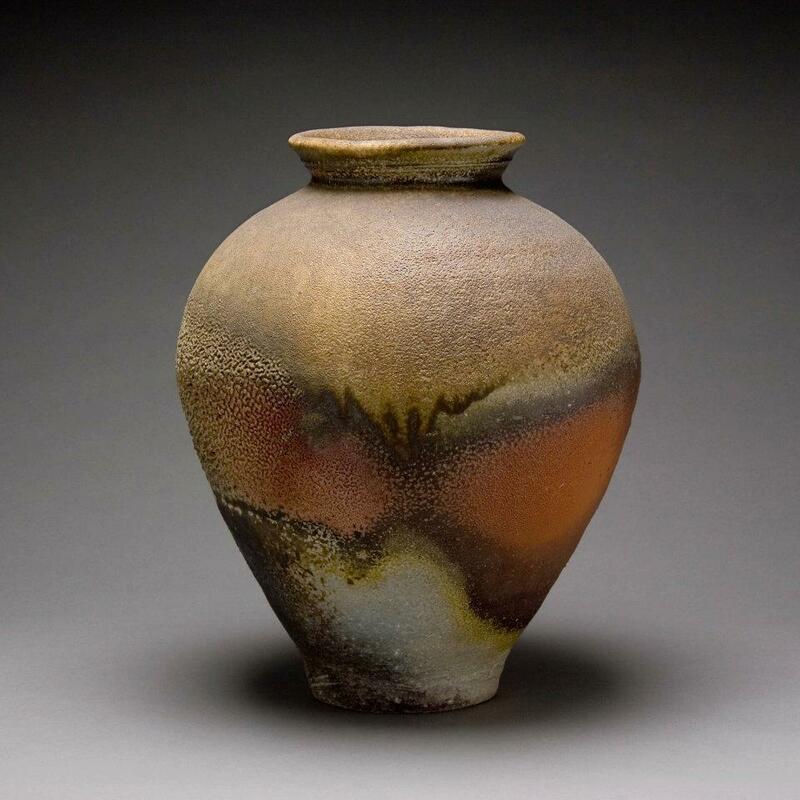 Shiho – Sunil san!.., Yes certainly following my success in early 1974 of using unseasoned firewood to fire my anagama kiln.., Later in that year in late April I held my first solo exhibition title – Works from the anagama at Nakamiya Gallery in Osaka. In the previous year I had shown in a group exhibition at Hankyu Department store, but those works were glazed ones. 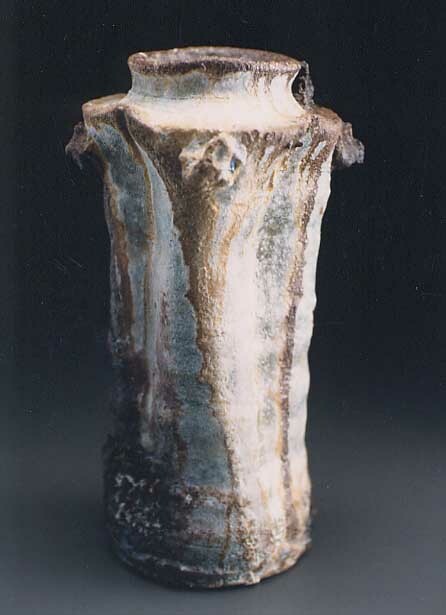 The natural glaze works which had given me the chance to become a potter, – the day to show the first of these came. It was the debut of the Shigaraki potter, Shiho Kanzaki. Many people came to the gallery and looked around at the works not only once, but two, three times. There were people who were sighing, people who nodded their head with satisfaction without finding the words to express their deep feelings toward the works, some who touched the work very gently, and people who sat in front of the couch I was sitting on, saying, ” let me rest for a while” after looking around so many times in the gallery. Many people were admiring the works one by one very carefully, walking around the gallery again and again. When these works were born, I made a firm decision in my heart: “Even if people in the world deserted me, I would fire these pieces, the work I’ve dreamed of.” But it was my misconception. I realized that I underestimated people’s appreciation. The eye to see beautiful things is the same for everyone. Watching the people fascinated by my work, my long struggles were instantly blown away. 5. Sunil – How would you describe your art to someone who has never seen your work? Shiho – Sunil san!.., have you ever seen natural ash deposits work? Look at this works closely; the deep blue which reminds one of the deep blue sea; the green like moss; the charred surface which reminds one of the creation of the earth; the harmony of distortion and myriad colors. These are the perfection of the natural glaze. And the shape of my works are explaining my life, very natural. shown at the Minneapolis Museum. My next question for you Is your work in any famous private or corporate collection? Shiho – Sunil san!.., thank you for asking me the question? Starting with my long time major admirer Walter and Molly Bareiss Collection – Their lived in Connecticut, USA. Unfortunately, he passed away. Yuji Saini Collection. – He lives in Nara, Japan. He collected 120 Shiho’s works including my recent new texture works. Published his collections, titled Yuji Saini Collections, Shiho Kanzaki’s works. And 4 other major collectors around the world, but they don’t like to openly publish their names. Do you take time off to do other activities Do you have other interests or talents that you would like to share with us? 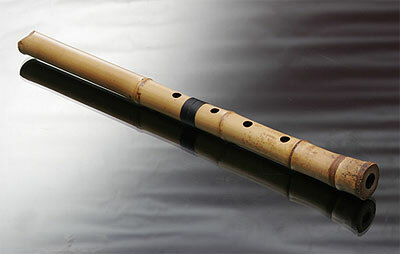 Shiho – Sunil san!.., Yes I enjoy another craft of making bamboo flute, and also the art of Japanese shakuhachi. Professional shakuhachi player use my shakuhachi. 8.Sunil – Describe yourself in 3 words; one has to be a colour? Shiho – Sunil san!..,certainly red, stone, horse. Sunil – I find that this question covers what you believe your personality is associated with red is the color of prosperity, joy and energy, stone signify to be firm, bold & stubborn and the Horse symbolizes – power, grace, beauty, nobility, strength, and freedom. 9. Sunil – If you had the choice of doing something different in your Life.., What would be your ideal choice ? Shiho – Sunil san!.., Quiet simply Nothing, only potter. I would do this all over again. Do you have any advice for ceramic artists just starting out? Shiho – Sunil san!.., Yes!! simply.., You should have big dream, and pursued it until you satisfied. Sunil – Thank you Shiho Kanzaki for sharing your wonderful experiences and allowing us the opportunity to follow your journey through your personal life.., we are honoured and blessed as a group to be able to attract members like yourself to be part of our group. 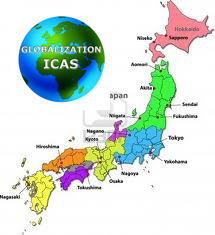 We look forward to your active involvement in playing a role in our future development of Globalization ICAS, may your future continue to bring you success and fulfillment. Shiho Kanzaki • Japan – Thank you very much for giving me your interview, Sunil Vilas san! I’m very proud to be here. Thank you! Didier Dubuy • France – Could you please Shiho tell us more about your daily frequenting of nature, very present in the description of your works & your beautiful Facebook page as well..? Do you have any habit, any ritual in that matter? Peter Filzmaier • Florida USA – Hello Shiho San, Your life’s phylosophy and creative endeavours are one and are an inspiration to all who add to the human process of creative living. The wisdom in your comment about the art of the past being the foundation for the evolution of art is a guiding light to my personal path. I am sure that your daily experiences continue to inspire you in your work and move you to evolve your work. Can you share some of the ideas that are currently influencing you in your work? Shiho Kanzaki • Japan – Thank you for your comments, Heather san! Didier san! Sunil san! and Peter san! I would reply to Didier san and Peter san. I’m enjoying nature riding on a bicycle in a fine weather. The healthy body and soul are required for my own creation. Before everything, I would like to say for you my thought. I believe that our spirits and thoughts are what make our ceramics. And making of pottery and a way of living are closely related. These two relationship is important. Wrong spirit or without soul makes not so good work. However, the reverse is also true. Our works are expressing all of ourself. I believe that the beauty of this work is not simply because of the shape, or due to excellent technique, or the beauty of the surface. For if the beauty of a work exists only in its good shape, design and colour, I suspect that its effect upon us may fade over the years. But if the spirit, the heart and the soul of the potter are in the pieces, these works can touch our heart and soul for many years. It’s my basic thought. So I always openly write about my story and my hobby on facebook. And I have to live according to nature. I became a priest for such a reason. I’m polishing myself everyday to become a good potter. I pray Buddha always especially every morning. Didier Dubuy • France – Thanks dear Shiho for your words & for this good moment we share with you. Heather Sarin • New Zealand – Thank you Shiho for your words of wisdom! I also meditate and sit and watch Mother Nature for hours in the state of reverie. I try and be humble and enjoy living a simple life-style. I have a lovely husband who is kind, considerate, very supportive and honest. I also have friends whose lives are not governed by greed, hypocracy and Ego. I am lucky to have such friends. Good people like you, Peter, Mona and Sunil inspire me. I love art and painting is yet another form of meditation. In that state I am at one with what I create. It is a wonderful feeling and the rewards are manyfold. Herminia Haro • Peru – Very inspired story. Patient is inherent to a good ceramist. Working the moisted clay, create a form and wait to it get dry day by day respecting its time, then hire the piece and wait to the surprise the klin will give us. Sometimes it’s not what we thougth but it’s always an inner creation that reflect our spirit.Thank you Shiho Kanzaki. Shiho Kanzaki • Japan – Thank you, Didie san! Heather san! and Herminia san! Heather san, you are living close to nature, arenT you? The life-style is most important thing. I like those life-style. Herminia san, I suppose that I can see the smile of kiln-God always. Thank you for your very generous comments. I grew up and was educated during the “time of confusion” following the Second World War. I graduated from college and entered society just as Japan was emerging from the aftermath of WWII, and was moving forward with rapid progress. Japan was getting wealthy both economically and materially. It was around this time that I decided to become a potter (a ceramic artist). While others were enjoying their material blessings, my mendicant-like life began under the dim light of an oil lamp in a tin hut which I built by myself. It was a struggle to feed myself…. It was only in 1976 that electricity finally came to my workshop. During this life of mendicancy (when I sometimes needed to depend on the alms of others), some people had left me, and others had helped me. Judging only from appearances, the latter is appreciated, while the former is not. But the truth is this: without the former, the latter does not exist; and without the latter there is not the former. (The former presupposes the latter; and the latter presupposes the former.) Bipolar opposition exists only in the phenomenal world but they are, in essence, one. I have done a lot of writing about my encounters with many people, both in my previous book, Honoo no Koe; Tsuchi no Koe (“The Voice of Fire, The Voice of Clay” from Nihon Kyoubun Sha) and in this book*. Because of these encounters, I can create pottery…or to say it another way: “I have become what I am now. “I am greatly indebted to these people for their kindness to me. Above all, I have wonderful parents, and a wonderful wife and daughter. I was born in a pottery town called Shigaraki, and have the Karma ** of Buddha. The Karma reaches back to the past and stretches to all places — it covers everything. How mysterious Once I realized this, my sense of pride and the sense that I had accomplished success by my own hands, literally disappeared. (“It opened eyes to new possibilities”) I had the opportunity to help fire the Shigaraki anagama with Kanzaki sensei.., It opened my eyes to new possibilities. 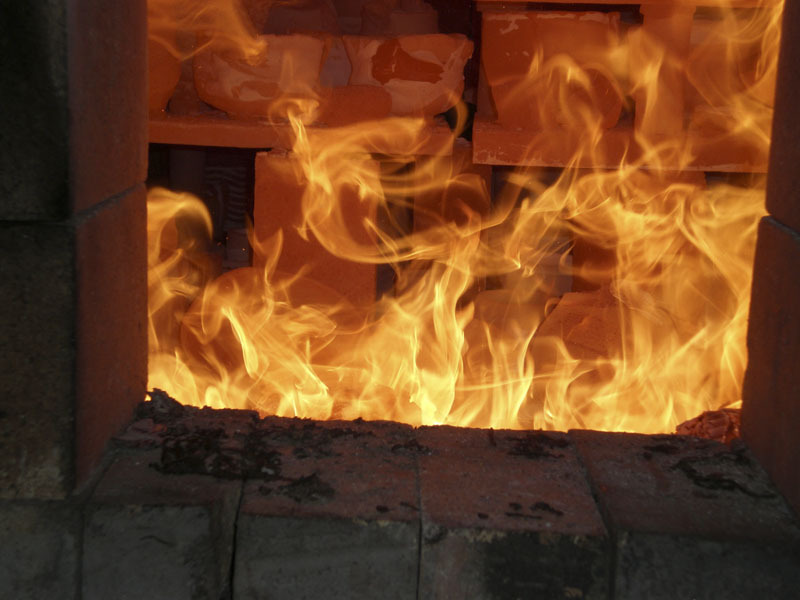 When I returned to the United State I began “species specific” firing; using only Chinese Elm asa a fuel; I developed new clay bodies for wood-firing; I began to fire for 15 days, to 1500 degrees Celsius. The result for me was they discovery of a new, wide range of natural colors; mauve, sea-green, pink, purple, violet, rose, yellow, orange. 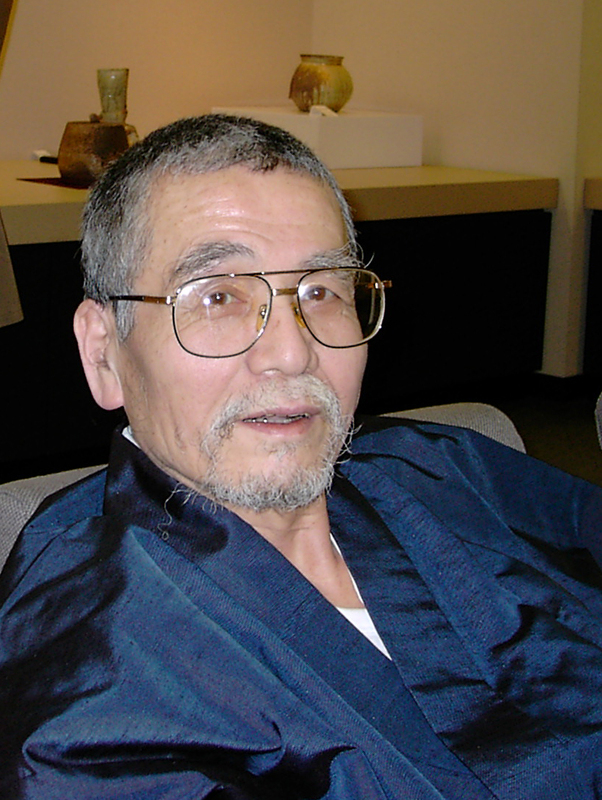 I am grateful for the generous teaching of Kanzaki Shiho sensei.., and I always remember his encouragement to make works with all my heart, mind and spirit. (“A World treasure”) I’ve seen many works from around the world and feel that Shiho Kanzaki’s forms are the best in terms of color, texture and the composition of these elements on each piece. His works magnify the intuitive yet ordered power of all natural forces. His mastery in understanding all things has produced works of impeccable stature in the contemporary idiom. I feel his works are truly a cultural heritage and in my heart a world treasure. (“I knew that I would be dealing with an exceptional man”). When I first saw Shiho Kanzaki’s work, I knew that I would be dealing with an exceptional man, unique and powerful. I could see his intelligence, his complexity and what some people would call his contradictions in each of his pieces, I could go while still keeping a good sense of balance and sensitivity. Meeting the man and the artist was even more of a revelation; I met a sincere, generous man, willing to share his knowledge with everyone, open to the world and ready to discover new things everyday. 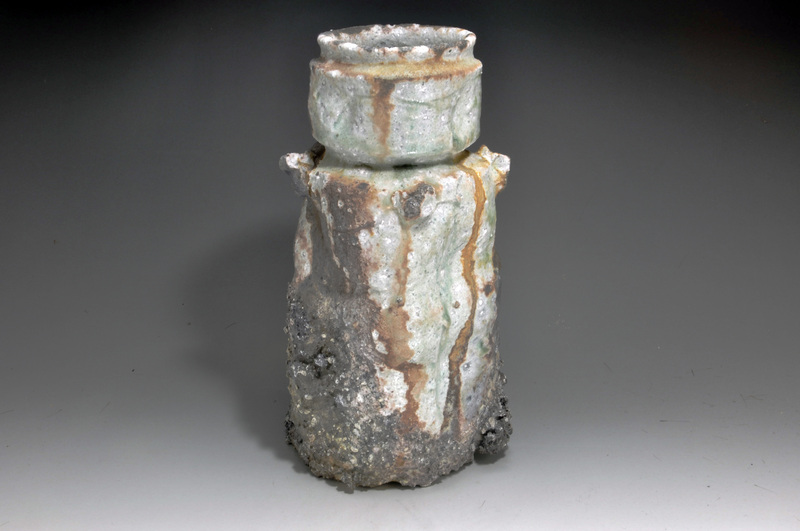 What do Red, Stone, and Horse have in common with Japanese Master ceramic artist’s Shiho Kanzaki? ART AND SCIENCE UNITED BY ONE IMPULSE AND ONE LOGIC!! We put to test and question the theory of creative dualism? The Lost Civilization and its Hidden Treasures of Peruvian Pottery An important lesson and role we can all play to preserve all traditional Art with connection to the ancient Civilizations that begins with an awareness program. What do Sunshine, River, Turquoise have in common with Canadian abstract artist’s Laara Williamsen? Mona Youssef realism painter’s exclusive interview in our VIP Creative Lounge. Meet Jake Fernandez today’s most celebrated Contemporary artist follow his life story to his successful career in ART!! Thank you very much Sunil san! for giving me your interview! I’m very glad and happy to have your interview. I have enjoyed following your work and appreciate the knowledge you have shared with me in the past. Your comments about the evolution of your creative process are timeless and universal. I am heartened to know that you believe that as artists we should not abandon the art of the past but use it as a foundation to release our own individuality. Too often abandoning the past leads us to a realm of art that is more an intellectual statement than an inspired original work. I thank you for your continued contribution to the world of art that inspires us add your experiences to our creative aspirations. Hello Shiho Kanzaki! It is truly an honor to learn about the delicacy of your art making and the years of dedication that you have spent creating such beautiful, intricate art works. I admire your devotion to your creative path and wish you much continued happiness and success on your journey! And thank you very much Sunil for your wonderful interview with Shiho Kanzaki! Thank you Shiho Kanzaki for sharing with us your inspiring journey. It is good to know that stubborn dreams do live when people have faith in them and never give up what they are really meant to be. Thank you for your very generous comment. I quite agree with you on that point. When our techniques, thought and soul extended the tradition, we can reach to new world. Thank you for your kind and generous comment. I need to try hard every day so that I am able to do a natural way of life. Thank you for giving me your kind comment. I am still in the middle of a way of my journey. I don’t know how to express my thanks to your comment. We have to have a big dream in your mind, and you should do effort to get the dream continuously. Don’t give up. It’s most important. I appreciate your kind comment. I think that I will be publishing one book in this year. Let you know it on my facebook page after I published the book. I am a scientist and professor at a university in Los Angeles who is also making high fire pottery, using traditional Asian glazes. I have a great interest in wood firing and your ware is just eternal. I will be in Japan in late September and I planed to visit Shigaraki. Would it be possible to come by? I do not want to intrude but it would be a dream to visit you. It has been a dream of mine to work in a Japanese studio for a while. 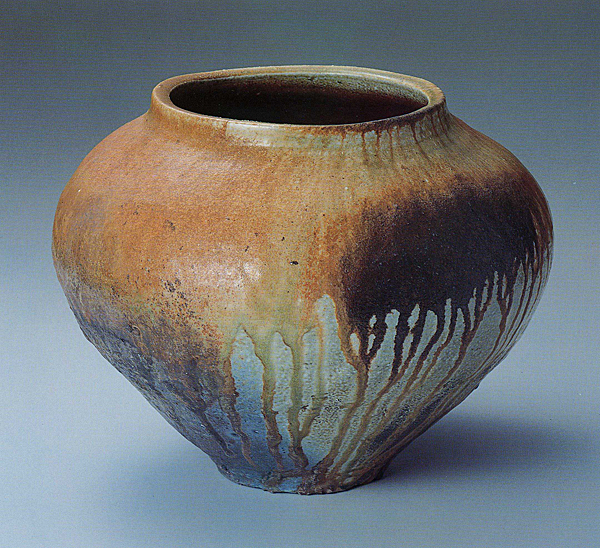 I will try to find a studio in Japan where I could learn more about the Japanese art of making pottery. Thank so much Sunil and Shiho for this interview. I’m sixty years old and I’m ceramist for 5 years ago. My dream is to go to Japan one day in Shigaraki, Seto, Kyoto, Nara….and meet you ! It would be a nice pleasure.